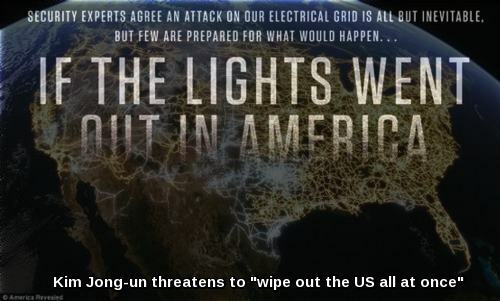 Experts have long warned that in the event of an EMP attack upon America, up to or more than 90% of Americans would die in the following year to 18 months due to a total breakdown of our electricity dependent society. As we learn in the story and videos below, such an attack might happen sooner than later and experts warn we'd likely not even find out about it until it was far too late. While most Americans laugh off such a possibility and say that it will never happen, the danger is all too real and as we learn in this story from World Net Daily via Joseph Farah’s G2 Bulletin, North Korea is now preparing a 'southern trajectory' satellite launch within the next several days or weeks said to be only a test launch but believed by former US Ambassador Henry Cooper to be something that could soon affect the lives of all Americans. According to Dr. Peter Pry in this BioPrepper story, North Korea is a mortal threat to America, right now. Even though South Korea and Japan are concerned about this latest provocation by North Korean leader Kim Jong-Un, we learn in this new story that the launch of a "satellite" between February 8 and 25 is actually aimed at 'crushing the US' and Washington DC if we're to believe anything at all that the North Korean leader says. He's also threatened to wipe out all of the US, all at once. Only an EMP attack would likely accomplish such a result. Cooper told G2 Bulletin the United States lacks sufficient anti-ballistic missile defenses in the southern part of the U.S., especially if the satellite turns out to be a nuclear device that could orbit above the U.S. and explode at a high altitude, affecting the lives of all Americans. He said it would be difficult to distinguish a test from an actual attack, and the best way to counter such a threat to the U.S. homeland is to knock out the missile at the time it begins its trajectory over a southern polar route. But he acknowledged such an action would be politically unpalatable. However, if the North Korean satellite turned out to be a nuclear device and is detonated over 100 miles above the U.S, it could destroy all life-sustaining critical infrastructures that rely on the national grid, potentially leading to the death of most Americans within the following year. All grid-dependent systems could suffer, including food- and water-supply chains, fuel-supply systems, communications, banking and finance. Sadly, this very possibility is all-too-real and the fact that most Americans have likely either never heard of an EMP attack or considered the possibility of it happening here in America will lead to hell unfolding within America in the event of such an event happening. 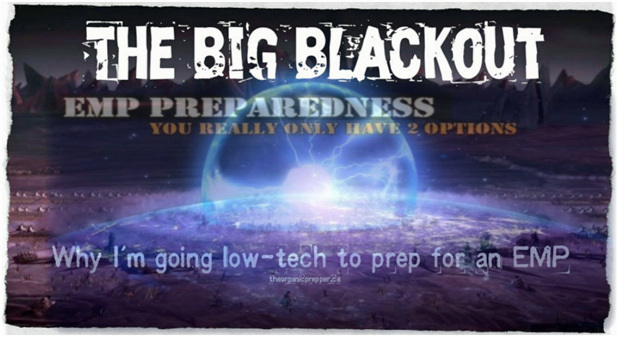 With only a small percentage of Americans being 'preppers' who are preparing for such a possibility, the devastation caused by such an event would be unimaginable with not only the above-mentioned grid dependent systems going down, but also nuclear power plants throughout the country. 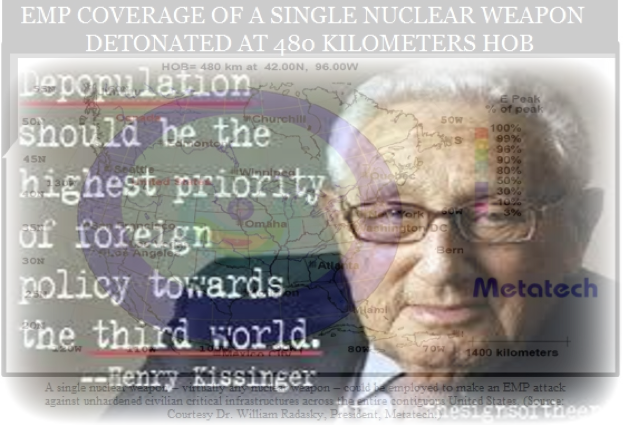 Even the best-prepared preppers will be in grave danger.We've reported on the elitist depopulation agenda before; what better way for them to accomplish such a goal than to unleash an EMP upon America with Kim Jong-Un and North Korea merely patsies to later be destroyed?We know for a fact that the heavily-govt-linked and sourced website Deagel.com forecasts a US population of 65 million in 2025, down from the current number of 319 million now. 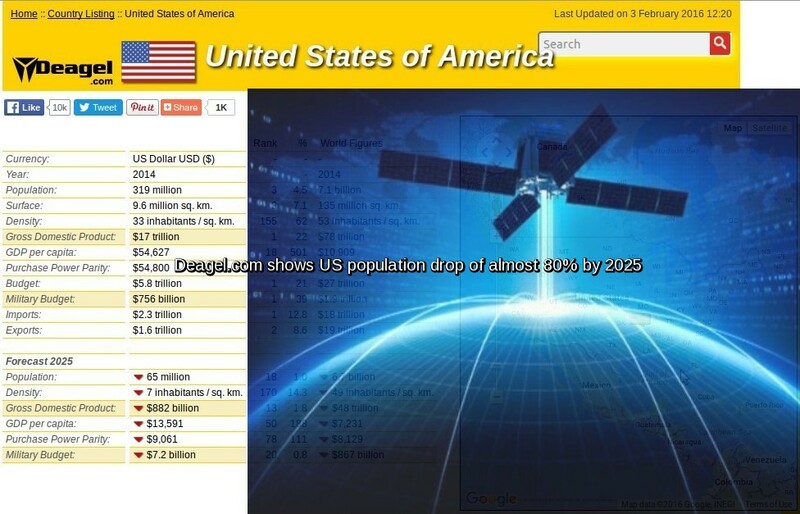 That's a population reduction in America of nearly 80% in less than 10 years. How do they think they'll accomplish that? An EMP attack would surely fit the bill. North Korea's Rodong Sinmun newspaper – a mouthpiece for the warmongering regime – said: "The reason why we've had the nuclear deterrence is not for dropping nuclear bombs on people in the South. "Our nuclear weapons program is aimed at crushing Washington's bid to stage a nuclear war and securing peace and stability on the Korean Peninsula." The comforting statement comes after the North threatened to detonate a thermonuclear weapon 100 times more powerful than any of America's nukes. Tyrant Kim Jong-un threatened to "wipe out the US all at once" after the nuclear test on January 6. The US and South Korea have cast doubts the North tested a full H-bomb – explaining the smaller blast indicated a standard atomic bomb or a hybrid "boosted fission" bomb. According to Dr. Peter Vincent Pry, the H-bomb recently detonated in a test by North Korea fits well within the requirements of a 'Super EMP', a device that could nearly instantly send America back hundreds of years and wipe out our electrical grid over a huge portion of the country according to this story from the Washington Examiner. In fact, according to Pry, the US is not only totally defenseless against such an attack but North Korea has practiced such EMP attacks against America already. Dr. Pry previously served on the 'Commission to Assess the Threat to the United States from Electromagnetic Pulse Attack' and his warning to us helps to explain much of the mystery that has surrounded this latest North Korean nuclear test that some experts said was nowhere near powerful enough to have been a hydrogen bomb test. We learn here of a 'different kind' of hydrogen bomb that would indeed have such a 'low yield' as was detected. Whether or not this is just another test and provocation by North Korea or setting up for the real thing, Americans should be prepared for such an eventuality, even if it never happens. Almost totally dependent upon our electrical system, we're sitting ducks for either an EMP unleashed by the sun or by a petty dictator. With likely radiation flowing freely in the US after such an event with the meltdown of our nuclear power plants, even the best prepared will have to deal with the repercussions of that. The huge majority of those who aren't prepared will likely be among the 90% of Americans to die. Fortunately, there are some excellent resources online that will help Americans prepare for such a devastating event. While we hope that we'll never have to use such knowledge, it's certainly better to acquire that knowledge now when we have the ability to do so than to attempt to acquire it in the future, when we no longer have that ability. A story linked to yesterday by Steve Quayle from the website of All Self Sustained is one such source. A story that Susan Duclos wrote back in August of 2015 also offers some outstanding advice. Please share any info that you might have in the comment section below. The videos below include a look at experts predictions on the timing of the North Korean satellite launch as well as two different videos that look at Kim Jong-Un's EMP threats upon America and the possibility that he is merely bluffing vs the possibility that he is planning to 'take out all of America, all at once'.